The tech world has brought us on-demand taxis, online food ordering services, an endless stream of movies, groceries delivered to your door, and companies that service your apartment as if it were a laundromat. So why hasn’t your need to poop been addressed? Because nature occasionally calls when you’re standing on the street nowhere near a clean toilet, Charmin -- the toilet paper company known for its happily defecating bears -- has been parading around a toilet van in New York City this week. Aptly hailed as “the Uber for Pooping,” the company’s project, Van-Go, is an “on demand private restroom” that promises to “bring you a better bathroom experience.” To use it, all you prairie-doggin’ folks have to do is visit CharminVanGo.com and fill out a simple form. Then, a porcelain throne can be delivered directly to your location before you’re forced to resort to the gutter. As part of its pilot project, Charmin is drumming up enthusiasm with the help of Black-ish star Anthony Anderson, for some reason. Anderson has been shuttling around on Charmin’s van this week to get New Yorkers psyched about pooping. On Wednesday, the on-demand service was available in Columbus Circle, Herald Square, and Bryant Park. Today, it’s stationed in Lincoln Center, Union Square and the High Line. The vans are in service between 8am and 5pm, a.k.a. prime pooping hours. By the looks of it, Van-Go comes with replete with a helpful staff and a poop emoji mascot, which you're encouraged to hug. While seemingly frivolous and available only to people who have smartphones, the idea of an on-demand bathroom points to a more critical issue facing major cities: lack of readily available public toilets. Last year, Google announced the introduction of a toilet-finding app in India, meant to you know, find toilets when options are scant. That innovation could be worthwhile in any number of places that lack public facilities. 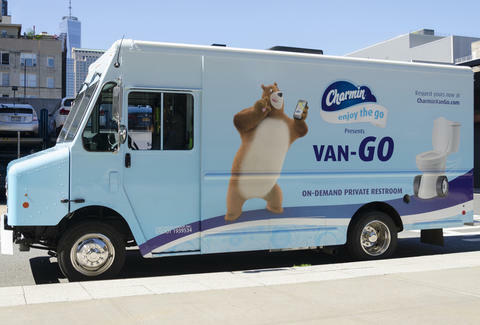 While there’s no word on Charmin’s plan to expand its Van-Go project beyond the NYC pilot, it’s clearly nigh time time for pooping to experience some kind of disruption.